Designed and built to reduce supply chain costs, the London Gateway port will facilitate new routing opportunities between the USA and UK and is integrated with Europe's largest logistics park at 9.25 million sq ft.
Hoboken, New Jersey, 19th June 2013 -- DP World's London Gateway, the UK's new deep-sea port and Europe's largest logistics park opening Q4 this year, was well received at a reception last night at the luxury W Hotel in Hoboken, New Jersey. This is the first of a series of insight events across the USA this week. 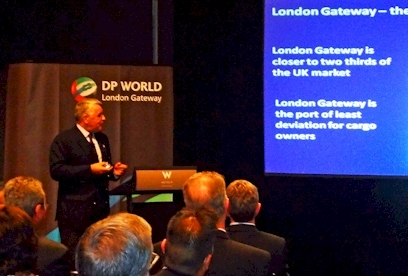 Exporters, importers and freight forwarders, attended the insightful presentation led by commercial director, London Gateway, Charles Meaby who explained how London Gateway will add value to Anglo-American trade and Peter Ward, supply chain commercial manager, presented on how companies can make significant savings on their landslide costs, making their supply chains more agile and profitable for today's commercial world. Leading companies like Marks & Spencer, who last week announced they are building a distribution centre at London Gateway's logistics park, have realised the savings UK's new global trading hub offers. Alan Stewart, CFO, Marks & Spencer, said: "We will reduce the lead times between goods landing in the UK and getting into our stores, in front of our customers, from about three weeks to three days." At the Hoboken reception, significant interest and a lively debate highlighted how London Gateway's unique tri-modal logistics hub, combining the UK's new deep-water container port and Europe's largest logistics park will provide US companies with new logistic solutions. Martin Karczewski, operations director at Laufer Group, said: "London Gateway is a no-brainer and DP World's significant investment makes perfect sense". A spokesman on behalf of one of the leading global forwarders remarked that: "London Gateway is bucking the trend. As ports around the world move further away from manufacturing and consumer markets in search of deeper-water for bigger ships, London Gateway is mitigating longer supply chains by locating the port and logistics park closer to the UK's main markets". VP business development for Charles Kendall Freight, Don Quigley, also acknowledged the potential savings in landside costs due to London Gateway's superior location. Designed and built to reduce supply chain costs, the London Gateway port will facilitate new routing opportunities between the USA and UK and is integrated with Europe's largest logistics park at 9.25 million sq ft. The London Gateway's team will move on to Chicago to address EyeforTransport's 3pl Summit and Supply Chain Officer Forum on Wednesday.